As a way of supporting those riders committed to their sport, manufacturers of palatable, nutrient rich Horslyx have developed a new Ambassador Scheme that offers six budding amateur riders the chance to become a Horslyx representative for 12 months, beginning in January 2014. Applicants should be passionate and dedicated to their sport, believe in feeding the Horslyx way, compete regularly in either unaffiliated or affiliated competitions and be very active on social media channels such as Facebook and Twitter. The Horslyx Ambassador scheme is open to riders above the age of 16 years old who are competing in any discipline. Horslyx want their newAmbassadors to hit the ground running and help spread the word about the range of products on offer and their versatile uses. Each of the six Horslyx Ambassadors will receive branded clothing and equestrian equipment, a supply of Horslyx to last the year and nutritional support whenever necessary. 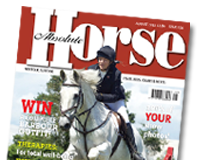 In addition Horslyx will promote their Ambassadors through regional press, social media and the website helping to gain valuable exposure to aspiring riders. Entries will close on 31stDecember 2013 and the 6 Horslyx Ambassadors will be announced by 31st January 2014. Terms and conditions apply.